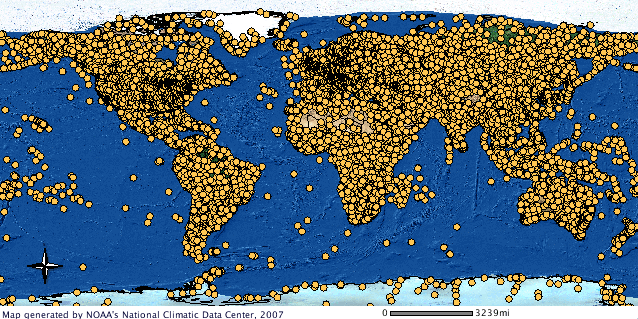 The Integrated Surface (ISD) Dataset (ISD) is composed of worldwide surface weather observations from over 35,000 stations, though the best spatial coverage is evident in North America, Europe, Australia, and parts of Asia. Parameters included are: air quality, atmospheric pressure, atmospheric temperature/dew point, atmospheric winds, clouds, precipitation, ocean waves, tides and more. ISD refers to the data contained within the digital database as well as the format in which the hourly, synoptic (3-hourly), and daily weather observations are stored. The format conforms to Federal Information Processing Standards (FIPS). ISD provides hourly data that can be used in a wide range of climatological applications. For some stations, data may go as far back as 1901, though most data show a substantial increase in volume in the 1940s and again in the early 1970s. Currently, there are over 14,000 "active" stations updated daily in the database. For user convenience, a subset of just the hourly data is available to users for download. It is referred to as Integrated Surface Global Hourly data, see associated download links for access to this subset. Direct download for the Integrated Surface Global Hourly (subset) dataset files. This sample data file shows how the data are formatted as a webform and is for example purposes only. This sample data file shows how the data are formatted by station ID and is for example purposes only. Documentation for the full dataset format including a data description, list of sources, format layout and definitions. Purpose Integrated Surface Data provides a long-term record of hourly, sub-hourly and synoptic weather observations from station networks around the world. Observation sources include the World Meteorological Organization, Automated Surface Observing System, Automated Weather Observing Stations, US Climate Reference Network, and others. Weather elements observed include sky conditions, visibility, weather type, dry bulb, wet bulb, and dew point temperatures, relative humidity, wind speed and direction, wind gusts, station and sea level pressure, altimeter, and precipitation. Online data are typically delayed for 24 hours. Lineage Statement The Integrated Surface Hourly Dataset is a merge of many observation streams to form a complete database of surface weather observations globally. Originally it was referred to as Integrated Surface Hourly Database (ISH), but has since grown to include data of various temporal periods (e.g., daily). The database holds data originating from sources such as the Automated Weather Network (AWN), the Global Telecommunications System (GTS), the Automated Surface Observing System (ASOS), and data keyed from paper forms. In addition, the database includes data originating from various codes such as synoptic, airways, METAR (Meteorological Routine Weather Report), and SMARS (Supplementary Marine Reporting Station), as well as observations from automatic weather stations. The data are sorted by station-year-month-day-hour-minute. Most digital observations are decoded either at operational centers and forwarded to the archive or one of its partners (including the US Air Force). Basic quality control may be performed prior to its arrival in the ISD database. For more information, please review documentation. Many observations have been merged into ISD, please review full Technical Documentation for more information. ISD Version 1 was released in 2001. ISD Version 2 was released in 2003 and included additional Quality Control Processing applied. In 2016, ISD received updated documentation and improvements to its processing, ensuring access to high, archive quality data. Source dataset landing page with general information and access links for that dataset. Description of Source: Source dataset for the product. Description of Source: Source Dataset is integrated daily with NOAA-SWO for completeness, extending the period of record. Description of Source: Several static datasets have been incorporated into ISD. Data are from Australia, Brazil, the Washington National Observatory, Greenland, Mexico, METAR Monthly Airways Extract (MAE), and the NSRDB.